Today I want to share with you Anne’s review of her cake smash experience. I have been photographing her son Lochlann since he was a bump and this was our third session together and possibly the cutest! I have been photographing cake smashes for six years now and they are one of my favourite sessions! You can see some of my cake smash portfolio here. 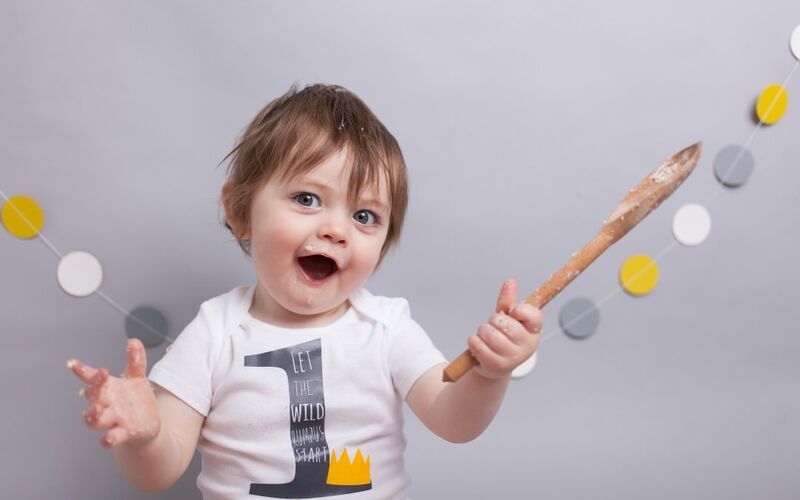 They are such a fun way to celebrate a 1st or 2nd birthday and I always love to see how each baby reacts differently when their cake comes out! 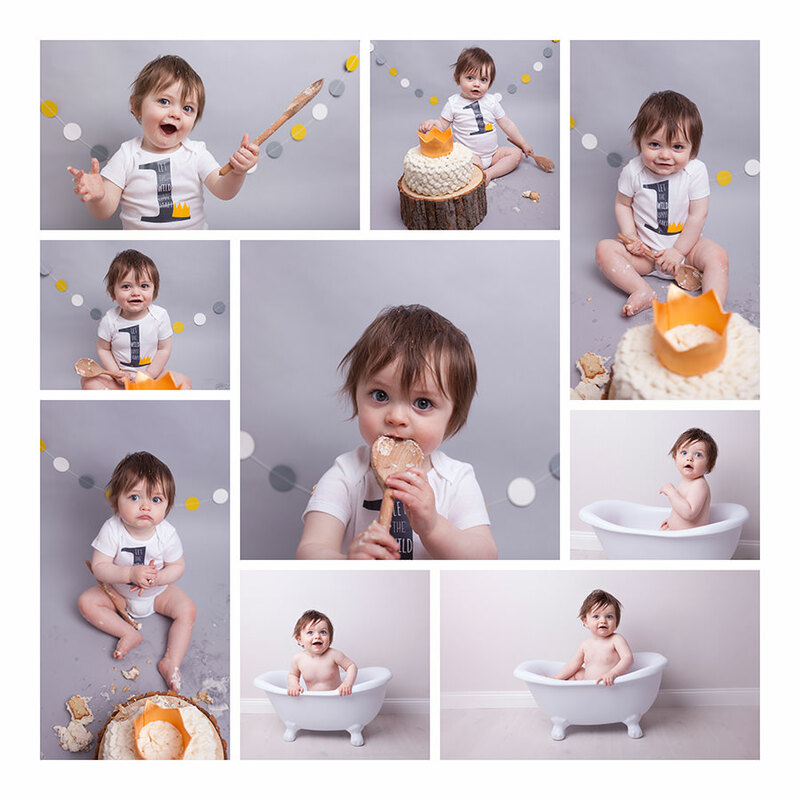 The cake smash experience involves photographing your baby in classic portraits before bringing out their custom designed cake before finishing with a bubble bath in our gorgeous roll top bath. The cake smash experience is different for every baby and thats one of the things I love so much about them! Anne left this review on my Facebook page and it absolutely made my day and summed up everything that I love about my job, watching your babies grow through their first year and getting to capture those magic moments for you. I couldn’t have been more relaxed coming to see Rachael for Lochlann’s cake smash session. It felt more like visiting and catching up with an old friend than an appointment, or something to check off my ‘to-do’ list. I had the pleasure of meeting Rachael a year ago when a random googling of ‘newborn photographers Edinburgh’ brought me to her website. I basically took one look at her portfolio and knew her style was exactly what I wanted for my son’s photos. That experience was so relaxed and calming to my hormonal, sleep-deprived, new-mommy self (not to mention the photos she took were absolutely stunning!) that I knew I would be coming back for Lochlann’s first birthday. The cake we ordered from Fiona at Red Cherry Cake Company (per Rachael’s recommendation) turned out even better than I expected. We went with a ‘Where the Wild Things Are’ theme, and her ‘furry’ white cake with gold crown was stunning and fit in perfectly with the other props that Rachael always seems to magic out of thin air to perfectly complete our shoot. I must say, Lochlann was a bit more reluctant to get his photo taken this time around. He’s just starting to walk and the last thing he wants to do most days is sit still. He was more interested in playing with her light stand and equipment than the cake that was as big as he was! Once again though, Rachael worked her baby magic and we managed to coax him into exploring and playing with the cake and captured some funny/adorable moments I can’t wait to visit over and over again. Did I mention Rachael works well with the whole family as well? Both times we’ve come for a photo session my mother has tagged along as this is her first grandchild and she loves to be involved in everything. Rachael has been so kind and welcoming to her, never making me or her feel like she was a burden or an unwelcome spectator. If you have been considering a cake smash experience to celebrate your little ones birthday please contact me to book. Availability varies each month but I am typically booked up at least a month in advance although i will always try my very best to fit you in!